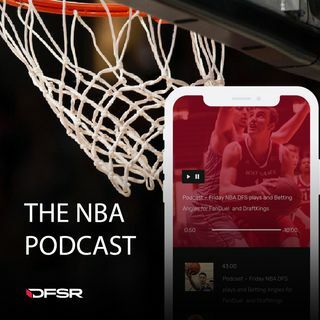 The DFSR crew is back on the podcast breaking down a 7-game NBA slate for FanDuel and DraftKings. There are some primetime matchups with the Thunder and Raptors facing off on the second half of a home and home after going to overtime on Wednesday. They talk about rostering Russell Westbrook and Kawhi Leonard in cash games with some discussion about Paul George as well. They also spend some time on the Grizzlies who will be without Mike Conley on this slate. That likely turns Delon Wright into ... See More a chalk play for both sites. And finally they break down the Nets and De’Angelo Russell’s ownership and whether it’s chasing points after his unreal comeback win on Tuesday. All of this and much more as the guys go game-by-game through the NBA slate.